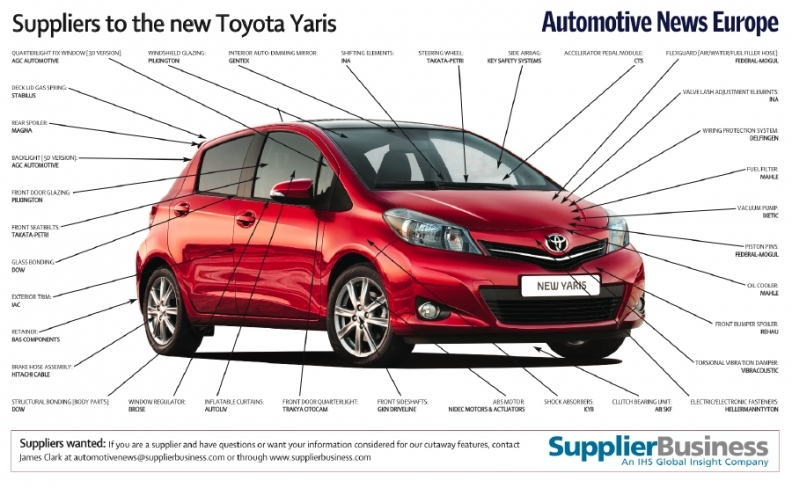 The new Toyota Yaris gets its windshield and front door glazing from Pilkington Group Ltd. of the UK. The sound-insulating acoustic glass windscreen features an inner layer of film designed to reduce wind, road and engine noise. In addition, the aerodynamic efficiency of the subcompact's new door mirrors and its single wiper blade further reduce wind noise in the vehicle. KYB Europe GmbH supplies the Yaris' shock absorbers, which have been enhanced through the adoption of a so-called "initial valve" to improve damping force response. The shocks also have a rebound spring to reduce roll (in sport-grade models). Magna International Inc. supplies the rear spoiler to Toyota's top-selling car in Europe, while IAC Group provides the exterior trim. In the powertrain, Federal-Mogul Corp. supplies piston pins and its Flexguard safety material, Mahle GmbH provides fuel filters and oil coolers, and Nidec Motors & Actuators sources the car's ABS motors. Toyota makes Yaris variants for Europe in Valenciennes, France. IHS Automotive anticipates stable output for the foreseeable future, with production reaching a high of 276,000 units in 2012.